Tindora / Ivy Gourd is finely chopped along with carrot. It is then mixed with boiled sweet corn and soaked peanuts. Dressing is prepared with lemon juice and herbs. Serve tendli carrot salad chilled. Makes: around 2 Servings of Tendli Carrot Salad. Tendli / Ivy Gourd 8 app. Wash, remove ends and chop the tendli into small pieces. Peel, remove ends, wash and finely chop the carrot. Boil the sweet corn till just soft and strain. Wash and very finely chop the cilantro leaves. Soak peanuts in warm water for couple of hours and strain the soaked peanuts. In a mixing bowl, mix together lemon juice, cilantro, crushed black pepper, mint powder oil and salt. Whisk well and stir in chopped tendli, carrot, sweet corn and peanuts. Taste and adjust seasonings of necessary. Serve tendli carrot salad chilled. Notes: Make sure to chop the vegetables to same size. Suggestions: Adjust the amount of ingredients according to your preference. Variations: Finely chopped cucumber can also be added for extra juiciness. Other Names: Tendli Carrot Salad. Corn is dehusked and grilled on all sides till dark brown. 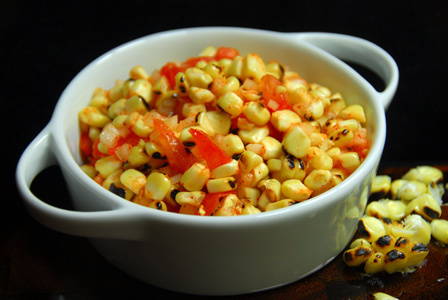 Roasted corn kernels are then separated and mixed with chopped onion and tomato along with other spices. 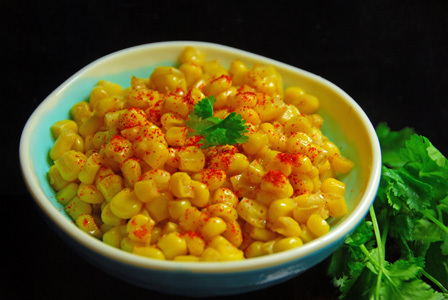 Serve grilled corn chaat as a snack. 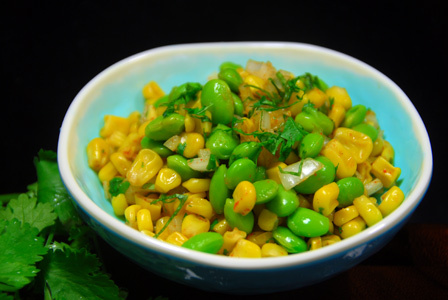 Makes: around a serving of Grilled Corn Chaat. Wash and finely chop the onion. In a mixing bowl, mix together with chopped tomato, onion, red chili powder and salt. Once done, remove the corn onto a plate. Place the corn vertically on the plate and use the knife to separate the corn kernels. Add the grilled corn to the mixing bowl and stir. 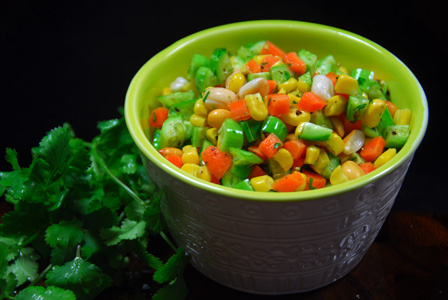 Serve grilled corn chaat as a snack. Variations: Add a tsp of lemon juice or grated raw mango to the corn chaat. Other Names: Grilled Corn Chaat. 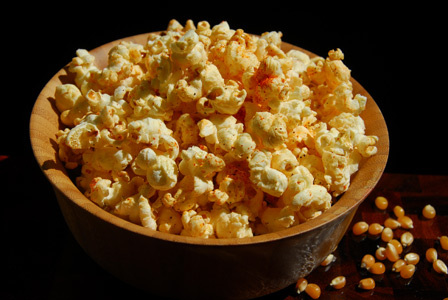 Popcorn kernels are popped in seasoned oil for masala popcorn. Here, garlic and garam masala is used for the heat. Serve masala popcorn immediately or store in air tight jar for couple of days. Makes: around a Serving of Masala Popcorn. Peel and lightly crush the garlic. Heat a deep pot like a pressure cooker on high heat, add oil. Test drop few popcorn kernels and cover the lid to let them pop. Once they pop, switch off the heat and add the popcorn kernels. Slightly cover the lid and leave for few seconds. Put the pot back on high heat, add the garlic, garam masala, red chile powder and salt. Cover the pot with the lid and let all the popcorn kernels pop. Shake the pop occasionally if required. Remove the popcorn from heat once the popping noise stops. Notes: Make sure to use a deep pot to allow the corn kernels to pop. Suggestions: Make sure to adjust the seasonings just after the popcorn is popped when its still little warm. Variations: You can also add a pinch of amchur for tartness. Other Names: Masala Popcorn, Masala Pelalu.